International Journal of Tropical Diseases is an open access peer reviewed journal dealing with the infectious diseases that break out in hot, humid conditions, such as malaria, lymphatic filariasis, chagas disease, african trypanosomiasis, leishmaniasis, schistosomiasis, onchocerciasis, and dengue, etc. 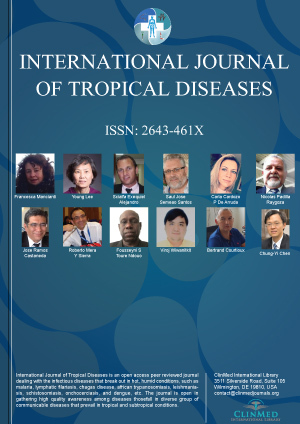 The journal is open in gathering high quality awareness among diseases thosefall in diverse group of communicable diseases that prevail in tropical and subtropical conditions. Journal gathers original research, reviews, communications, letters, cases and short articles related to chagas disease, dengue, helminths, african trypanosomiasis, leishmaniasis, leprosy, lymphatic filariasis, malaria, onchocerciasis, schistosomiasis, sexually transmitted infections, TB-HIV, TB, neglected tropical diseases, "exotic" diseases, prevention and treatment of tropical diseases, controlling tropical diseases, globalization and disease, etc. The journal includes recent advances in improving the understanding of disease and the safe and effective treatment of patients. Published articles are available online without any barriers to use and reuse under the terms of attribution license.